Icelandic international Johann Berg Gudmundsson accepted that the Clarets will have to address their away form if they want to survive another season in the Premier League. 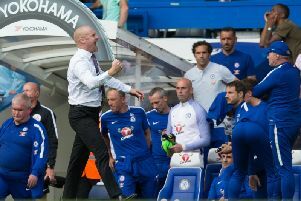 While performances have been building, Sean Dyche’s side culminated their campaign on the road with just seven points from 19 games. It finished with a 2-1 loss to AFC Bournemouth at the Vitality Stadium, meaning only relegated Hull City finished with a worse record. And the 26-year-old winger feels that Burnley may need to find a better balance next term as they head in to the final game of the season against West Ham with 10 wins at Turf Moor. “It is a contrast,” he said. “In the beginning we didn’t play well away from home but it came during the season, we had some good performances, but it just didn’t happen for us, so that’s something we need to fix for next season. “The home form has been tremendous and next season we want try and get the away form better. “The Premier League is a tough place to go away but I think we’ve put in decent performances to get more points but it just hasn’t happened. “We definitely need more points. We want to get more away points and that’s going to be our aim for next season. Gudmundsson has made just 10 starts for the Clarets in the top flight during a campaign plagued by injury. He admits that he hasn’t played anywhere near as many minutes as he would’ve liked since making his move from Charlton Athletic in the summer but was happy to contribute on the south coast. After supplying the cross for Sam Vokes’s equaliser, he said: “I want to be on the pitch more than I am at the moment, but when I come on I try to do my best and I got the assist and that’s my job. “The result was frustrating though. Conceding straight after we equalised was tough. We tried to get back into but we couldn’t so it was really frustrating today we couldn’t get the point. With the Welshman only a goal shy of double figures in the league, Gudmundsson added: “He was tremendous, I think he probably won 99.9 per cent of his duels and he stuck one in, it was a great header.